SPEaC Happy (aka The Happy App) is a new tool for triggering staff engagement that measures the temperature in the workplace and encourages staff to give candid and constructive feedback anonymously to help streamline workflows, build more efficient work processes and improve job satisfaction and staff morale. It comprises a software application and bespoke teaching and training package designed to encourage staff to actively engage with managers in improving their working environment and standards of patient care. SPEaC Happy can be customised to work for any trust for a one-off build cost and an annual licence to cover software support, usage and training. While working on large-scale change management projects in the NHS, Anne Frampton and co-founder of FH intuition Andrew Hollowood saw the potential to unlock the wealth of information known to front line staff and make it available in real time to managers and leaders to promote staff engagement and local leadership. Their working knowledge of the NHS, coupled with a passion to improve patient outcomes have been the driving force behind the formation of a new start-up, FHIntuition and a bespoke website and app for staff engagement and change management for use across the NHS. 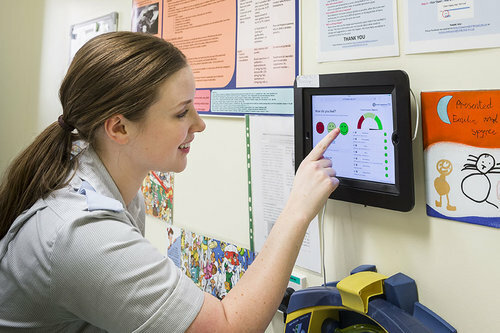 FHIntuition’s work at University Hospital Bristol won the HSJ 2016 award for staff engagement, giving the impetus to improve functionality and trial the web application with more hospitals. Thanks to a year’s funding from Health Education England and an EU Innovation for Growth Grant, the SPEaC Happy app is sparking a feel good factor among staff and patients across the NHS.